Printed circuit board layout plays an important role in the overall electromagnetic compatibility of any electronic system. PCBs that are laid out based solely on design rules will usually fail and require costly fixes. To avoid issues, there are several things you can do. During the circuit design period, keep the following PCB layout considerations in mind to ensure that the electromagnetic compatibility of your product isn’t compromised. What is the fastest system rise time and highest frequency? What are the electrical requirements at the sinks and sources’ inputs and outputs? Have you considered sensitive signal routing like controlled impedance, propagation delay on a trace and termination? Is the microstrip capable of handling sensitive signals? If the microstrip isn’t able to do the above can you use a stripline technique? Does each different supply voltage need it’s own power plane or can some be split? When you’ve asked and answered your questions, make a diagram with the system’s functional groups such as the transmitter path, receiver path, and signals (analog and digital). Look for interconnections between at least two of the groups and pay attention to those. Consider the return current and crosstalk to the other traces. Figure out the minimum width, separation and height of the trace and determine the distance between the two layers. You’ll need to know the minimum drill and requirements of vias and if you can use blind vias and/or buried vias. As important as vias are to most routings, it’s important to note that they add inductance and capacitance, and even cause reflections to occur. Furthermore, they increase trace lengths and should be avoided in differential traces. Another thing to consider for PCB layout is signal speed. Keep high-speed signals away from low-speed signals by separating them. Do the same for digital and analog signals. This will minimize crosstalk between each signal and each layer, especially if they are routed within 90 degrees of each other. 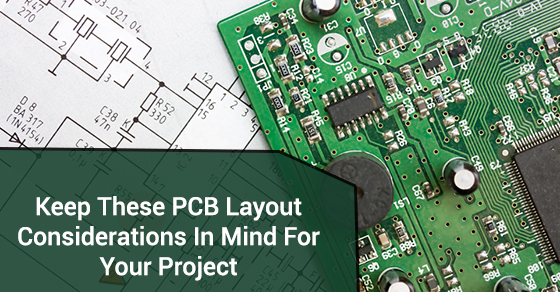 The importance of PCB board layout is not to be taken lightly. If you adhere to the above considerations, your next project you shouldn’t encounter any serious electromagnetic compatibility issues. Hooman attended University of Toronto for electrical engineering, and received his bachelor of commerce from Ryerson in Information Technology. For over 10 years, Hooman has been a leader in electronic manufacturing services helping clients from with various assemblies of PCBs and prototype designs.